Between the holiday decoration teardown in late December and the sweeping of confetti after New Year’s, it’s easy to forget that an important March holiday is just around the corner (and no, it’s not St. Patrick’s Day). It’s Employee Appreciation Day (March 1, 2019). Here at Hallmark Business Connections, we can’t help but ask why. The truth of the matter is, showing your employees that you care on Employee Appreciation Day doesn’t have to be difficult or time-consuming. Below you’ll find a foolproof way to pull off a meaningful Employee Appreciation Day for your team. 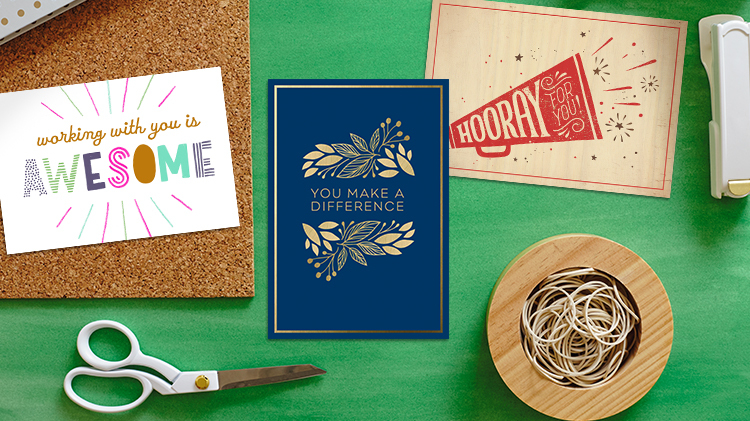 Hallmark Business Connections offers a variety of employee recognition cards that are perfect for Employee Appreciation Day. Shop employee recognition cards right now on our online card shop, where you can pick, personalize and send cards to all of your employees. We’ll even address them, affix a stamp and Hallmark goal seal and send them for you. Looking for something a little more customized? We also offer enterprise solutions to help your organization celebrate Employee Appreciation Day and other holidays both big and small. Our enterprise greeting card solution ensures that you send the right message to the right person at the right time, no matter what the occasion. Contact us for more information. Be specific: State exactly what you’re thanking or recognizing them for. Be sincere: Share your personality. Use your voice and style in the writing. Be relevant: Show how their efforts relate back to the company’s goals and values. At Hallmark Business Connections, one of our favorite things to do on Employee Appreciation Day is bring in lunch or a snack. A little midday treat with a sincere recognition card can go a long way. It’s easy to make a meaningful connection with your team on Employee Appreciation Day (or any day!) with a little help from Hallmark Business Connections. Contact us to see how we can help even more.